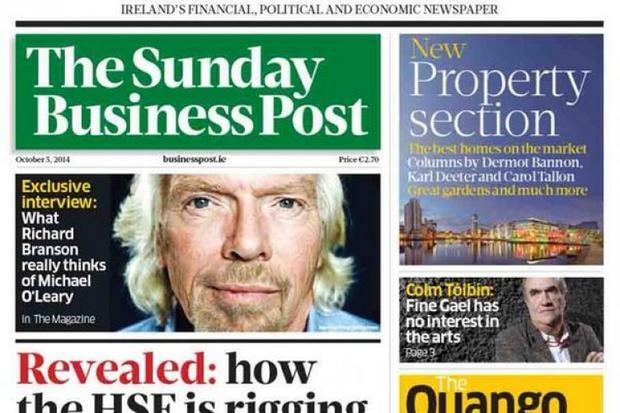 The ‘Sunday Business Post’ newspaper has been sold to Galway-born businessman Enda O’Coineen’s Kilcullen Kapital Partners. It comes almost 12 months after current owner Key Capital put the business up for sale. In a statement confirming the sale agreement, Sunrise Media, the entity that is selling the newspaper, said it expects the title to be profitable in 2018 and that “no significant changes are anticipated” before what it expects to be a strong final quarter of the year. Enda O’Coineen is a former journalist and previously publisher of titles including sailing magazine ‘Afloat’. His ventures include setting up the Czech & Slovak Credit Bureaus, mortgage business SIMPLY and the hugely profitable Globix Telecom as Central Europe deregulated and moved to free market systems in the wake of the communist collapse. The most recent accounts filed for Post Publications Ltd, the company behind the newspaper, show the publisher swung to a pre-tax loss of just over €520,000 in its last financial year, ended June 2017, following a small profit in 2016. Irish investment firm Key Capital bought the newspaper out of examinership in 2013. The investment company is chaired by Conor Killeen, a former chairman of NCB Stockbrokers. ‘Sunday Business Post’ chief executive Siobhán Lennon confirmed the sale in a statement. “I am delighted that the sales process has been concluded and want to thank everyone at Key Capital. “Also I would like to pay tribute to the team in ‘The Sunday Business Post’ for their commitment to championing Irish business and promoting independent quality journalism,” she added. “We look forward to our future with the Kilcullen Kapital team and driving The Business Post on to its next exciting phase,” she said. The latest Audit Bureau of Circulations (ABC) data, which tracks the media market, show the ‘Sunday Business Post’ had a weekly circulation of 28,701.